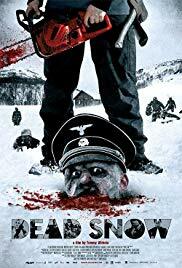 I’ve watched Dead Snow (2009). In it, a horde of frozen Nazi zombies attacks a group of young people in their mountain retreat. If I recall correctly, the zombies aren’t just the zombified remains of a WWII German army killed in a mountain pass; they are still ideologically Nazis. Or at least, really, really mean. Movies that feature Nazi zombies, and the other bad guy zombies–Imperial Japanese, Soviet Russian, and Viet Cong varieties–are not zombie movies. They are movies with zombies. At least, they aren’t real zombies if they maintain their ideological nastiness. Yes, I am old school–the true zombie is the Romero zombie (Night of the Living Dead ). These are the standard by which all other zombies are to be measured. As I’ve written earlier, zombies cannot be fit into categories of evil. Zombies are monsters that embody philosophical materialism, a philosophy for which there is no room for moral classification of evil. Nazis are evil. Zombies can’t be evil. There is no such thing as Nazi zombies, only zombies wearing Nazi clothes. Zombies are only hungry, they are not evil. Nazi zombies break the rule. When they don Nazi ideology with the uniform, they aren’t true zombies. The film Dead Snow goes so far as to imbue its zombies in a stereotypical Nazi hatred of, well . . . everybody, and also gives them, if I recall, a revenge narrative. Perhaps we are not comfortable with a monster that isn’t evil; we cannot face the implications of our own worldviews that the zombie monster interrogates. But just because we hid under the blanket, doesn’t mean the monsters disappear.